This article discusses one aspect of the land grabbing phenomenon that has been little addressed in the past: the economic dimension. 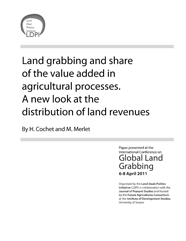 The supposed economic efficiency of large-scale land investments is yet to be challenged. During the second half of the 20th century, small-scale family based production systems became the rule on all continents in detriment of large-scale production. However, nowadays, we can witness the rapid development of new institutionalized forms of agricultural production (e.g. contract farming, agribusiness) that are characterized by an increased separation between capital and labour. Based on a review of case studies from Eastern Europe and Latin America, the authors show that the above mentioned developments are leading to a growing gap between return on capital and remuneration for labour. Labour compensation is often well below labour productivity levels. Moreover, capitalist investors manage to negotiate very cheap access to land (whether sale or rent based) and there are currently no land taxes in place to compensate for this situation. Therefore, most of the value added goes to pay return on capital, disregarding both compensation for fair labour and the land rights holders (whether individual or collective). Key words: land grabbing, capital, value added, labour compensation. AGTER took part in the International Conference Global Land Grabbing (Brighton 6-8 April 2011), organized by the Land Deal Politics Initiative (LDPI), the Journal of Peasant Studies et the Future Agricultures Consortium of the Institute of Development Studies (IDS, Sussex University). Hubert Cochet (Professor, AgroParisTech [Paris Institute of Technology for Food and Environmental Sciences] and Chairman of AGTER) and Michel Merlet (Director of AGTER) presented a paper which explore the economic dimension of land grabbing, based on two in-depth case studies in Ukraine and Ecuador. The paper can be downloaded on this page or on the Conference website (www.future-agricultures.org/).